Along the quiet shores of Pepper Creek near Dagsboro, a world-class attraction is beginning to take shape. 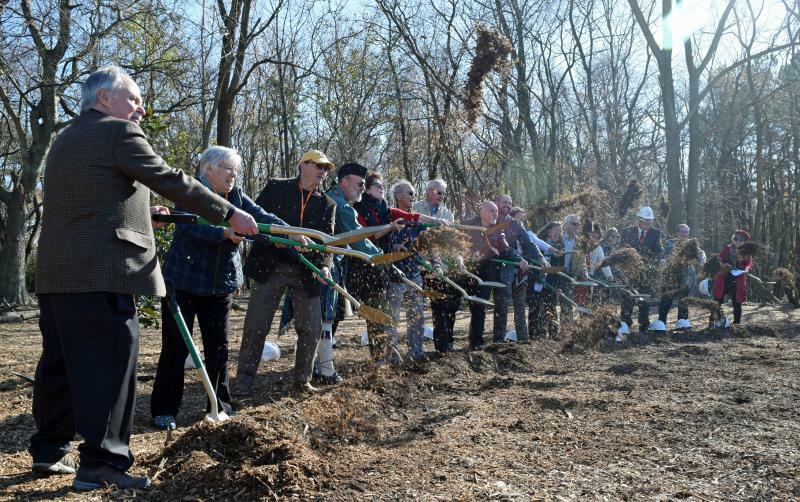 State and local officials, volunteers and supporters broke ground Dec. 1 at a 37-acre parcel set to become Delaware Botanic Gardens at Pepper Creek featuring natural woodlands, wetlands, meadow gardens and a serene waterfront view. The concept of establishing a botanic garden in southern Delaware began years ago and was solidified in 2014 when the group signed a lease with the Sussex County Land Trust to use the former farmed tract for $1 a year, renewable for 99 years. Now the minds behind the design of the gardens, including world-renowned Dutch author and horticulturist Piet Oudolf and landscape architect Rodney Robinson, have a 10-year plan to meld native plants with other eye-catching foliage, carefully incorporating green infrastructure. Organizers say a grand opening is set for 2019, but a lot of work still needs to be done. So far, trails have been carved out in the woodlands feature, providing a winding walkway beneath pine groves and alongside century-old southern red oak and sassafras trees. As volunteers cleared the first paths, they took an artistic approach, arranging brush and branches into massive bird’s nests that provide a sneak-peak at the creativity expected to bloom at the site. “We obviously have horticulture in our veins, and it’s wonderful to have a project of this inspiration and potential in Sussex,” said Thère du Pont, president of the Longwood Foundation, which provided a $750,000 grant that has helped kickstart the project. That grant required the group to raise $500,000, most coming from individual donors. The multimillion-dollar project, nestled among modest houses and rural countrysides on Piney Neck Road, will be completed in phases, with temporary buildings expected to be in place when the garden gates first open. As fundraising continues, organizers plan to build LEED-certified buildings, including an open-air pavilion overlooking the woodlands, a visitor center and educational features. As the garden grows, horticulturists will plant 8,000 shrubs, 2,000 trees, 150,000 perennials, 600,000 bulbs and 100,000 native plants. An annual report released by the organization in 2015 found the land, which includes 1,000 feet of waterfront along Pepper Creek, is valued at more than $1 million. Initially, the gardens will create about a dozen jobs, not including contractors and construction crews, and will eventually provide more than 100 jobs when the project reaches maturity. While the board has secured the initial funding needed to get the gardens ready for the public, pledges and volunteers are always needed. For more information or to get involved, go to www.delawaregardens.org. Breaking ground on the Delaware Botanic Gardens site are (l-r) DBG Vice President Ray Sander, Gov. Jack Markell and DBG Director of Horticulture Gregory Tepper. Breaking ground at Delaware Botanic Gardens at Pepper Creek are (l-r) Longwood Foundation President Thère du Pont, Speaker of the House Rep. Pete Schwartzkopf, Dennis Forney of the Sussex County Land Trust, Sussex County Councilman Rob Arlett, DBG Vice President Ray Sander, Gov. Jack Markell, DBG Executive Director Sheryl Swed, DBG board member Carla Markell, DBG President Sue Ryan, DBG board member David Green and DBG board member Diane Maddex. Landscape architect Rodney Robinson talks about gardens bridging the divide among people during a groundbreaking ceremony Dec. 1. DBG Vice President Ray Sander celebrates a major milestone in the progress of the gardens alongside about 175 supporters of the project. Dozens of people had a chance to tour the woodlands featured in the Delaware Botanic Gardens. Clarksville resident Diann Sherwin snaps a cell phone photo of one of the many cool trees in the woodlands. The Delaware Botanic Gardens site includes several vernal ponds, a rare type of wetland also known as Delmarva bays. While clearing paths through the woodlands, volunteers created large birds nests out of the branches they collected. Delaware Botanic Gardens at Pepper Creek features 1,000 feet of waterfront. The paths through the woodlands lead to the edge of Pepper Creek. This southern red oak is more than a century old. DBG Vice President Ray Sander joins DBG Executive Director Sheryl Swed at a groundbreaking ceremony Dec. 1. DBG President Sue Ryan thanks supporters for helping make Delaware Botanic Gardens a reality. Delaware’s first lady and DBG Advisory Council Chair Carla Markell has supported the gardens since the beginning. DBG Vice President Ray Sander, left, welcomes Dennis Forney of the Sussex Land Trust, thanking him for the organization’s foresight in preserving the tract. Forney is also the publisher of the Cape Gazette. Celebrating the groundbreaking for Delaware Botanic Gardens are (l-r) DBG President Sue Ryan, DBG Advisory Council Chair and Delaware’s first lady Carla Markell and DBG Executive Director Sheryl Swed. Speaker of the House Rep. Pete Schwartzkopf, left, joined Gov. Jack Markell at the gardens groundbreaking ceremony Dec. 1. DBG Director of Horticulture Gregory Tepper said he can’t wait to get planting.